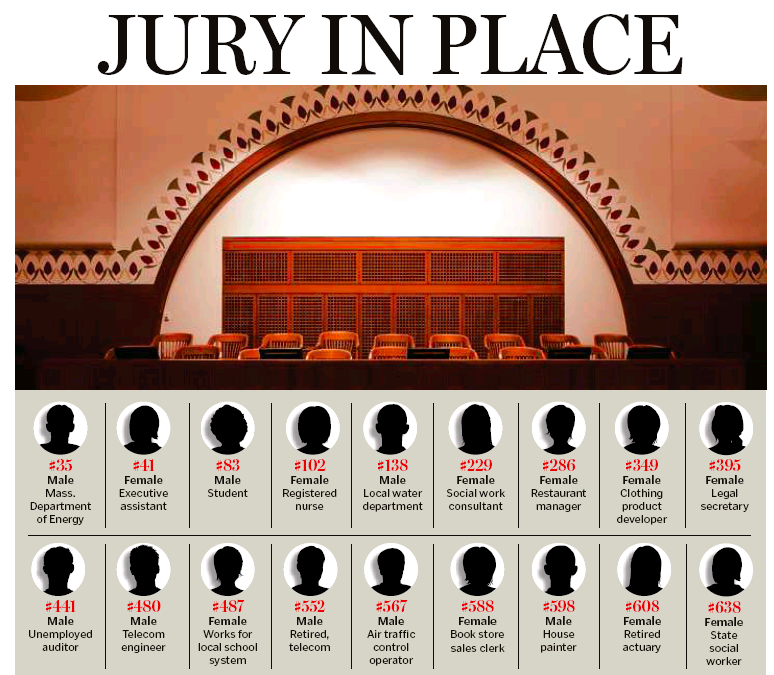 After an initial pool of 1373 potential jurors (who filled out a 28-page questionnaire) was whittled down to 256 by presiding US District Judge George A. O’Toole, whose interviews yielded 75 possibly unbiased jurors who then shrank to the Elite Eighteen – 12 jurors and six alternates – Boston now has an actual jury for the trial of Dzhokhar Tsarnaev for the Boston Marathon bombings that killed three people – Martin Richard, Krystle Campbell, and Lingzi Lu (along with MIT police officer Sean Collier) – and wounded over 200. And the finalists had their cotillion in Wednesday’s local dailies. This is shaping up to be one hellacious bakeoff between the two local dailies. Fasten your seat belts, as Bette Davis would say. It’s going to be a bumpy trial. 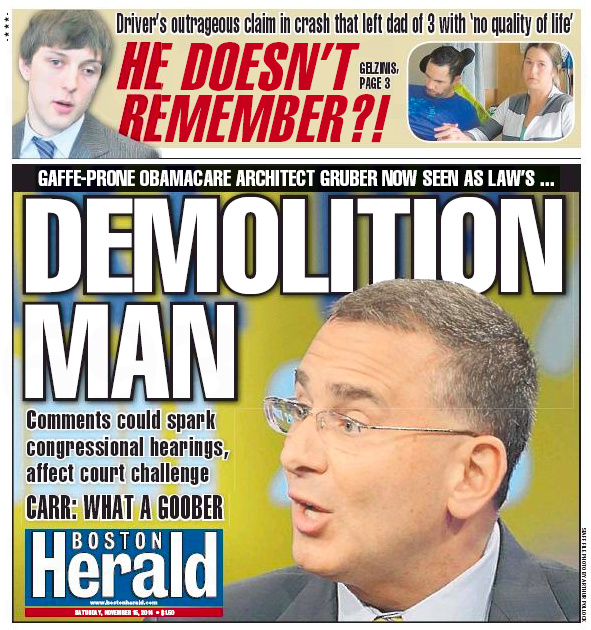 It’s Day Five of the Jonathan Gruber rumpus and the Boston Herald is still on it like Brown on Williamson. The derail Obamacare piece is especially noteworthy, since it is – as the great Raymond Chandler would say – thinner than the gold on a week-end wedding ring. 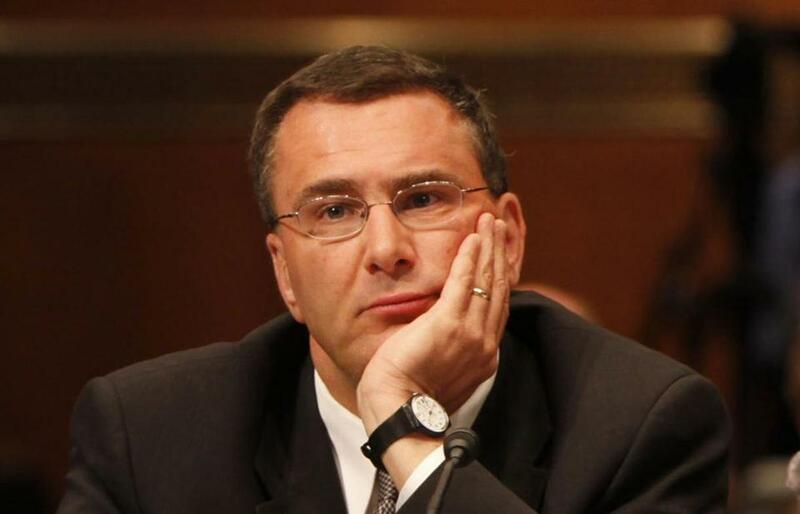 Obamacare architect Jonathan Gruber — the MIT brainiac caught on video admitting the law’s “lack of transparency” was meant to dupe a gullible American public — could end up becoming Obamacare’s demolition man, with congressional Republicans threatening to hold hearings and experts saying his bombshell comments could impact the Supreme Court case challenging the Affordable Care Act. Those “experts” turn out to be one guy from a conservative think tank. Then again, maybe not, since the subterfuge was meant to keep Obamacare’s penalties from looking like a tax, while the Supremes have already declared it is a tax. Crosstown, the Boston Globe has studiously avoided GruberGaffe, with only one report so far, buried in yesterday’s A section. But tomorrow we get this Joan Vennochi column. GIVEN THE ongoing frenzy over photos of Kim Kardashian’s rear end, it’s easy to understand why some people might underestimate the intelligence of the American public. And now Gruber’s getting cuffed – by Vennochi, by the Herald, by the GOP, probably by Pope Francis in the next few days. There’s a nifty little rumpus underway over a gaffe by a local healthcare guru who sort of told the truth by accident. 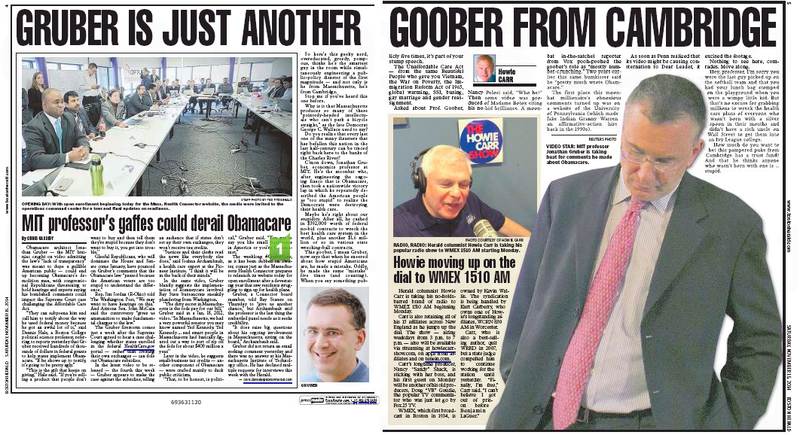 In yesterday’s edition, the Boston Herald was on it like Brown on Williamson. An MIT professor considered one of the architects of Obamacare is being blasted by critics over a video they say shows him admitting the law’s “lack of transparency” was designed to dupe a gullible American public. 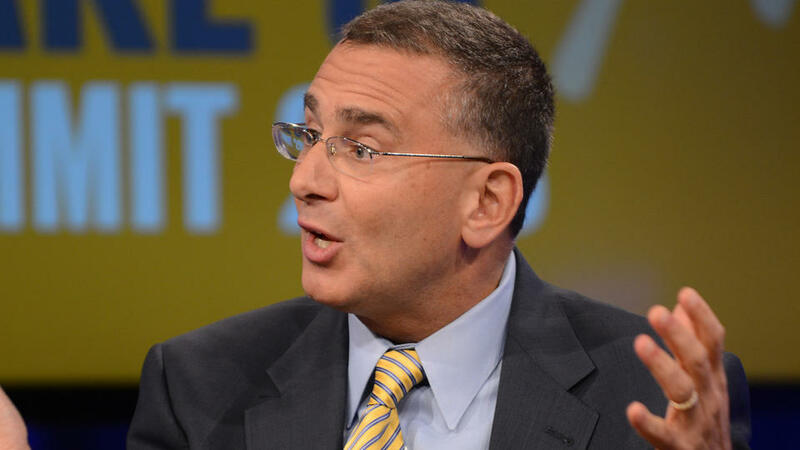 Gruber then hied himself to the friendly confines of MSNBC for damage control. But that did nothing to mollify the projectile pundits on the right. 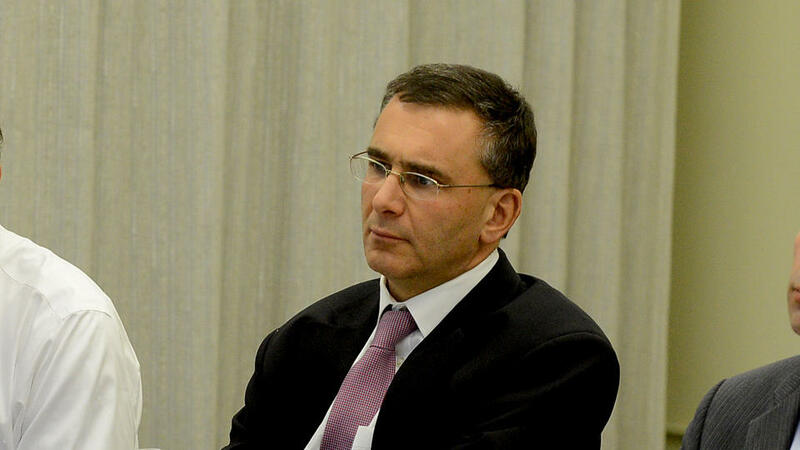 Gruber declined a Herald request for an interview. 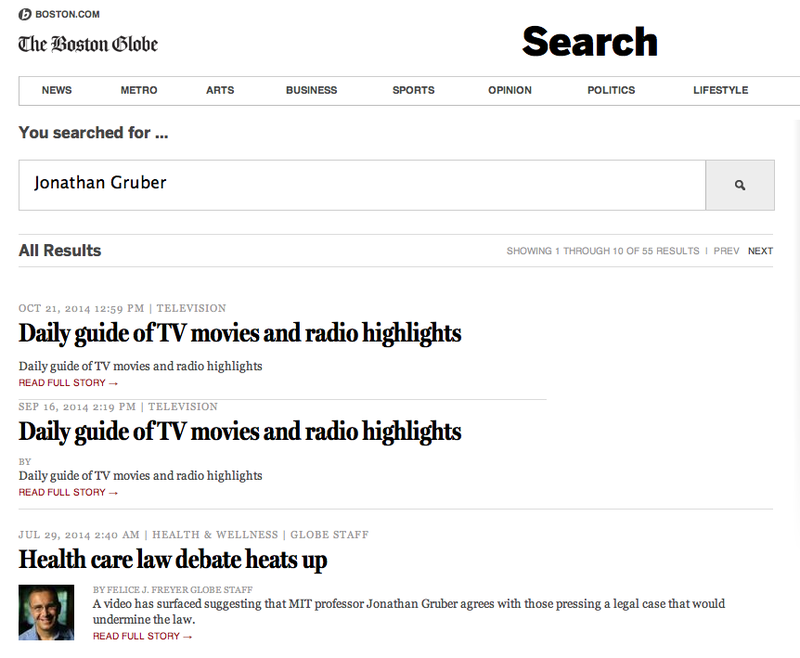 Also not surprising: The Boston Globe has ignored the whole donnybrook. Not-quite-matching her & her columns in the local papers on the topic of U.S. Attorney Carmen Ortiz and her (over? 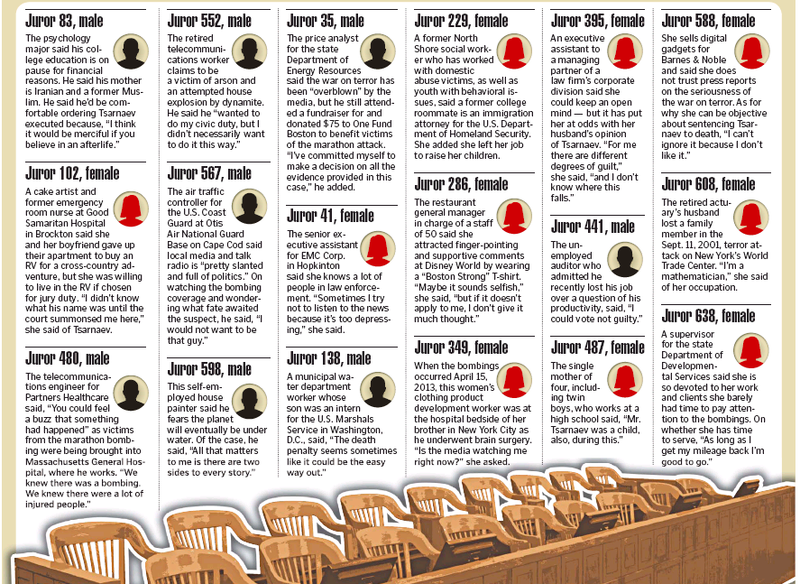 )zealous prosecution of Aaron Swartz. Just days ago, speculation was rampant. Gov. Carmen Ortiz? U.S. Sen. Carmen Ortiz? Well, that’s all over now. 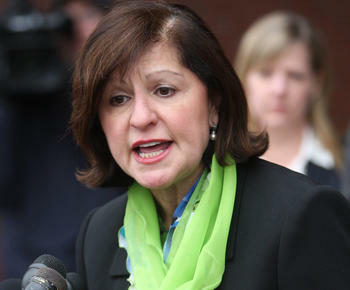 U.S. Attorney Carmen Ortiz is done. Finished. Forever linked to bringing the full and frightening weight of the federal government down upon a 26-year-old computer genius — and a suicide risk. Crosstown at the Boston Globe, the view was quite different in Joan Vennochi’s op-ed piece. WHEN IT comes to the prosecution of Aaron Swartz, the 26-year-old computer prodigy who killed himself, US Attorney Carmen Ortiz has explaining to do. But there are also questions for Swartz’s lawyer, Elliot Peters. Why reject the government’s offer of a four-to-six month prison sentence? That’s much less than the 35 years and $1 million fine allowed under the federal law that Swartz was charged with violating. Peters told the Globe that Swartz didn’t believe he was a felon; he was acting on the principle that information on the Internet should be free when he downloaded academic journals from an MIT computer system. But defending principle was not his lawyer’s job. It was to provide Swartz with the best legal advice, given the charges and the government’s refusal to back down. So take your pick – did Oriz bully Swartz or are Internet thugs bullying her?